The Water Warriors Power Shot XLs are small, trigger-based blasters akin to the older Water Warriors Power Shot or Water Warriors Kwik Grip. The set found so far was a 2-pack, though single packs as well as 3 or even 4-packs of these water blasters are likely to appear in the future. Like the older Water Warriors trigger-based blasters, the Water Warriors Power Shot XL provide reasonable power for their price. The Water Warriors Power Shot features a very small, functional nozzle that produces a short burst of water. Perhaps more in line with the Water Warriors Kwik Grip XL, the output and stream duration are not particularly high. Nevertheless, the streams are decent for this type of water blaster, though are definitely easily affected by any crosswinds. 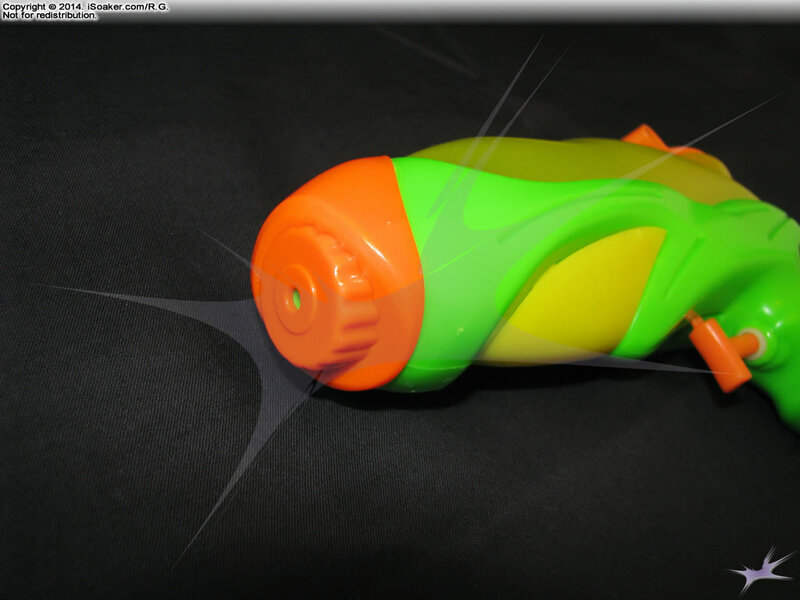 The Water Warriors Power Shot XL uses a trigger-based pump mechanism. 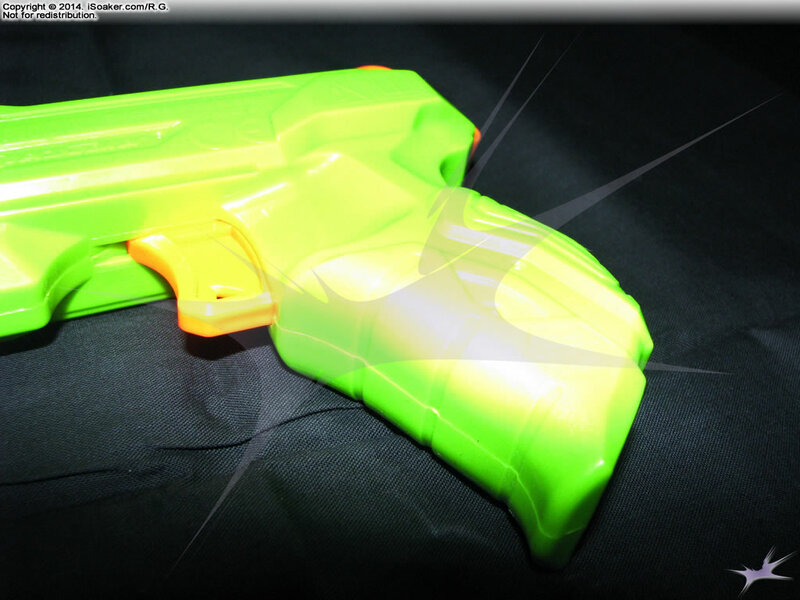 Unlike the original Water Warriors Power Shot, the Water Warriors Power Shot XL does not have any added feature and the trigger, while smooth, does not yield any significant advantage over typical squirt gun trigger-based pumps. 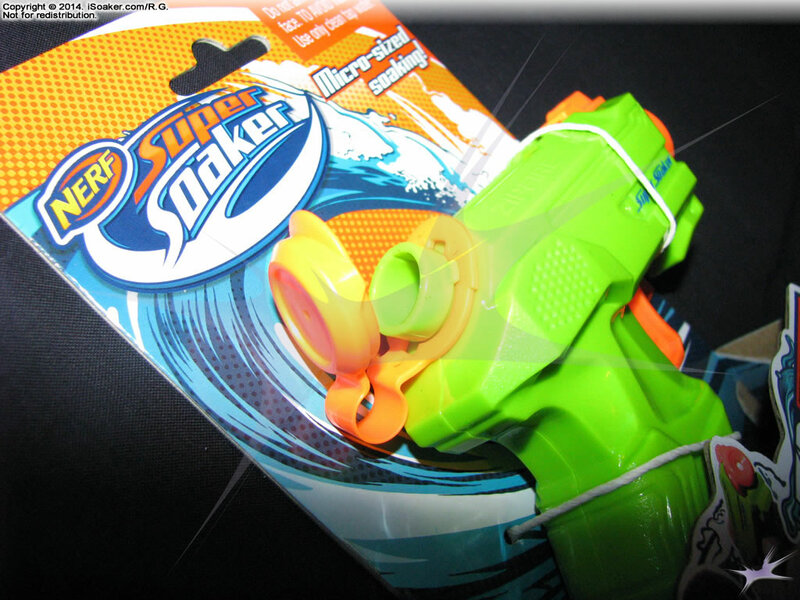 Pulling the trigger creates a near-instant stream that pushes slightly more water than the original Water Warriors Power Shot, but like the original, the stream only lasts as long as the trigger is moving. The force of the stream is fully dependant on how hard the user can squeeze the trigger with their finger. 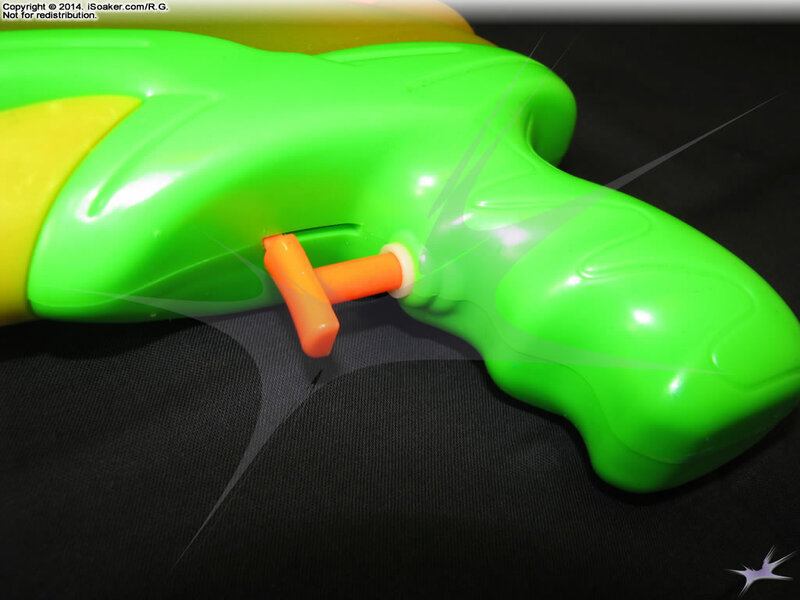 The trigger and grip area on the Water Warriors Power Shot XL is a little shorter than on the Nerf Super Soaker Zip Fire, thus those with larger hands may find that their pinky has no place to rest. The indents on the grip are on the small side, but then again, these water blasters are probably best used by younger Water Warriors. Nevertheless, the grip is function, though not as refined as grips found on current Nerf Super Soaker models. The reservoir on the Water Warriors Power Shot XL holds roughly 50% more water than the Nerf Super Soaker Zip Fire. It also uses a snap-cap closure, akin to the older Water Warriors trigger-based water blasters. However, the snap-cap on the Water Warriors Power Shot XL does not necessarily provide a perfect seal; while the cap prevents water from leaking when in general use, one out of the two Water Warriors Power Shot XL models tested would dribble out water if left on its side for a longer length of time. As such, a user must be a little weary about keeping a filled one of these in their pocket when not in use. 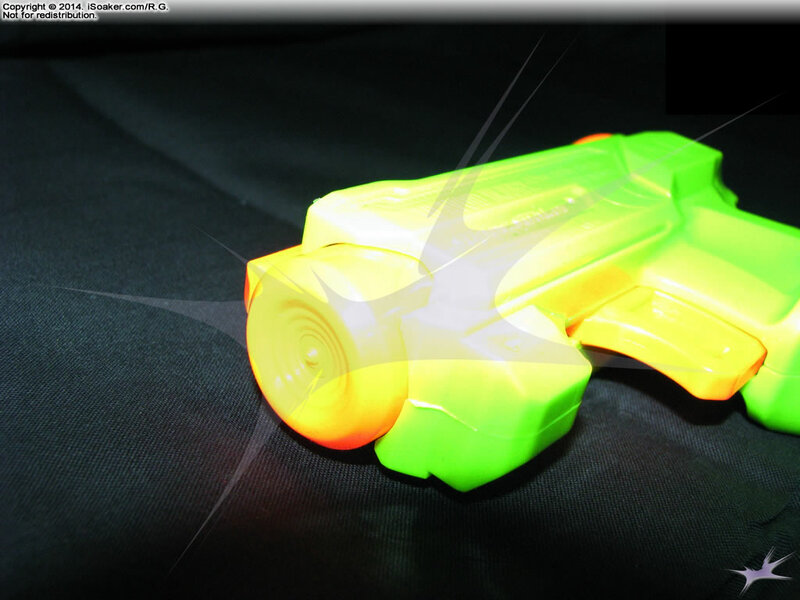 As a whole, the Water Warriors Power Shot XL is a small, trigger-based water blaster. While older users will find its output and range very limited, perhaps the Water Warriors Power Shot XL is most useful for younger users or maybe for indoor use when one does not wish to get anything significantly wet. Of course, going up against any larger water blaster would be seriously discouraged. The Water Warriors Power Shot XL has its use in only the most casual or very small scale water fight where any hit would count, but forget about being able to significantly soak your opponents. Comfortable to hold even for its small size. Good capacity for a water blaster of this size. Limited pump volume and output. Snap cap ma leak if water blaster left on its side. Thin streams easily affected by wind.